I really enjoy reading this chronological Bible – it reads more like the continuous historical story is was rather than skipping back and forth over hundreds of years. Right after the recounting of Job’s suffering and restoration, this Bible inserts Psalms which were written by Israelites who were exiled and in captivity. These psalms are full of ‘whys’ and ‘get us out of here’ along with confessions of the sins that brought them to this place. How often do we experience this same thing? We make bad decisions, we make wrong choices, we do what we want to do instead of what God wants us to do and our actions take us to a place in our lives that we don’t like. This is not where we want to be. We don’t want to stay here. Why am I here, God? Get me out of here! Just like the Israelites, we need to confess our disobedience and turn back to God. We need to stop the rebelling and let God help us start moving in the right direction. It won’t happen overnight….but it will happen. God has promised that he will work it all out for those who love him. But we need to listen and obey – that’s our part. When we really trust God, our hearts can be full of praise – in any situation. We see that with the Israelites as praise to God sometimes broke through all of the questioning and complaining – like this part of Psalm 44. Let’s join them in praising our Father God today! 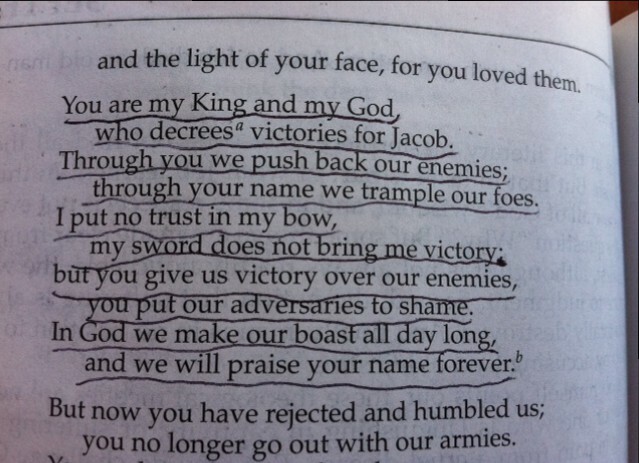 You are our King and God who has given us victory from generation to generation! You give us strength to push back our enemies! Because of your power in our lives, we can trample the darkness all around us. We don’t put our trust in our own strength or in our own wisdom – they will not bring us victory. Only you, dear Father, can win the battles for us. Only you can beat out the forces that we fight each day – both seen and unseen. We want to boast about you all day long! To everyone! We will praise your name forever! We love you, dear God!